Physicists have demonstrated that energy quantization can improve the efficiency of a single-atom heat engine to exceed the performance of its classical counterpart. 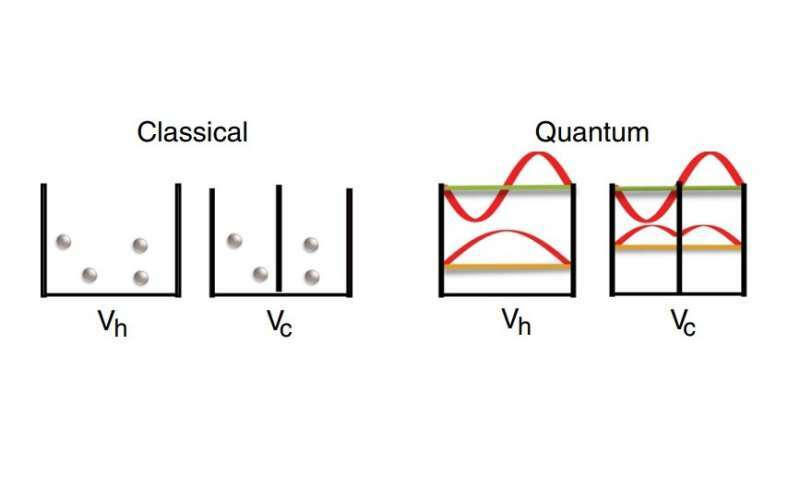 Energy quantization, in which the energy levels of a system occur only in discrete values, is a quintessential feature of quantum systems and differs from the continuous energy levels that occur in classical systems. The physicists, David Gelbwaser-Klimovsky at Harvard University and coauthors, have published a paper on using energy quantization to improve the performance of heat machines in a recent issue of Physical Review Letters. In their work, the researchers compared the performance of classical and quantum heat machines, which convert heat into work. In the classical version, a compressible working substance (usually a gas) is required for operation. When the working substance is heated, it expands and drives the engine's mechanical motion. In practice, it can be experimentally challenging to reach the large compression ratios needed for high performance. However, in the quantum version with quantized energy levels, the heat engine does not require a compressible working substance, but instead can function with incompressible working substances. So overall, when considering energy quantization in a heat engine, the classical paradigms break down and large compression ratios are no longer needed to obtain highly efficient heat engines. As the scientists demonstrated, the appropriate manipulation of energy levels leads to higher efficiencies and opens the doors to realizing heat machines that are classically inconceivable. The physicists also showed that, although energy quantization can improve heat engine efficiency, the efficiency is still subject to the Carnot limit—the fundamental limit on the efficiency of any heat engine. In addition, the performance improvement only occurs when the quantized energy levels are inhomogenously scaled, which is a regime that so far has received little attention. In the future, the researchers plan to further investigate this regime, as well as explore different kinds of working substances, such as those composed of interacting or indistinguishable particles. In the 60, and 70 there was talk of energy and friction coming in discrete packages of quanta then it all seemed to disappear, it's good to see its emergence.